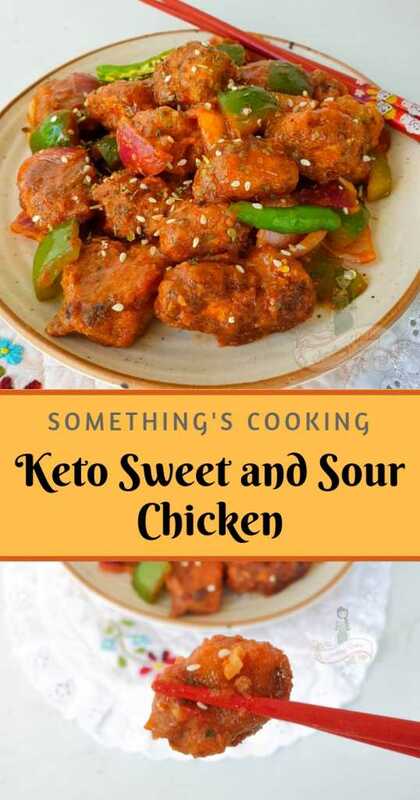 Skip the takeout and prepare this easy, guiltfree Keto Sweet and Sour Chicken at home! It is packed with tons of flavor and you will probably devour it in no time! In my last post, I mentioned my plans on taking up the Keto Diet again. I had tried many fad diets before and they were just that- fad, fancy, trendy. But ever since I have taken up Keto, I realized I can control my cravings and still indulge in foods I love. So, what is Keto Diet actually? Ketogenic diet or Keto diet is a low carb, high fat, and moderate protein diet. Over time, we have tuned our body to focus on eating more carbohydrates (than necessary) which thereby becomes the basic and most important source of energy. But Keto diet forces you to have more fat, reduce the carbs to a minimum and thereby asking the body to burn fats for energy. Your daily calorie intake would be anywhere between 65-70% Fat, 20-30% Protein and 5-10% Carbohydrates. It takes about three to five days to enter the stage of ketosis. This is when your body realizes it doesn’t have enough carbs to use for energy and produces ketones or organic compounds that starts burning fat for more energy. Why is Keto Diet So Trendy? Ever wondered why celebrities like Kourtney Kardashian, Halle Berry, and Jenna Jameson opted for Keto diet? The answer is simple: you see a visible change in your body in a matter of days. This is because when you have carbohydrates your body retains water and stores for later use, in case you are deprived of food. But when you reduce the carb intake, this water weight is lost initially, like any other diet. However, when you continue depriving your body of carbs, the body is forced to burn fats resulting in a dramatic weight and most importantly, inch loss. Of course, weight loss, duh! It also helps in managing diabetes and PCOD. But the most important thing which I realize is that there is definite appetite control, more energy, better physical endurance, and mental performance. There is no bloating and I always feel energetic and stressfree. The best part? Better skin and no acne. Since you will be focusing on fats and proteins, you will have to say goodbye to your bowl of pasta, or your french fries, cakes, bread, rotis, and rice. Say no to sugar and carbs. Befriend coconut oil, olive oil, cheese, butter, full-fat cream, and ghee. Eggs, meat, greens, psyllium husk, and fiber-rich veggies are your best friend. Opt for chia seeds, pumpkin seeds, flax seeds, almonds, and sunflower seeds for snacking. Hot sauces, mayo, salt, pepper, herbs are great to prepare your stir-fries. Avoid fruits except for berries and avocado. 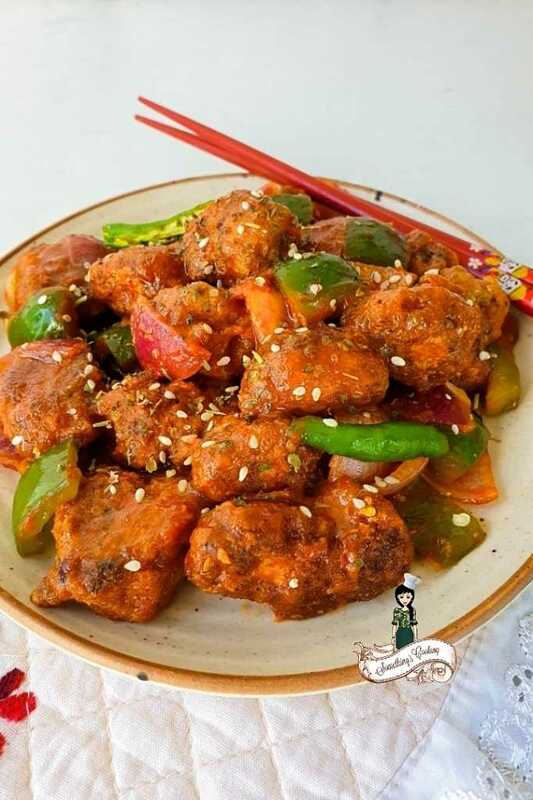 Sweet and sour chicken is a staple Chinese takeaway for many. Because yes, it is crazy delicious. I love my Chinese any day, but the sad part is, most of the time, such stir-fries require your protein to be coated with flour and cornstarch. As you know by now, Keto prohibits the usage of flours. That’s when I found an alternative – Psyllium husk which will do the flour’s job in perfection. The homemade Keto Sweet and Sour sauce takes this recipe a notch up higher! 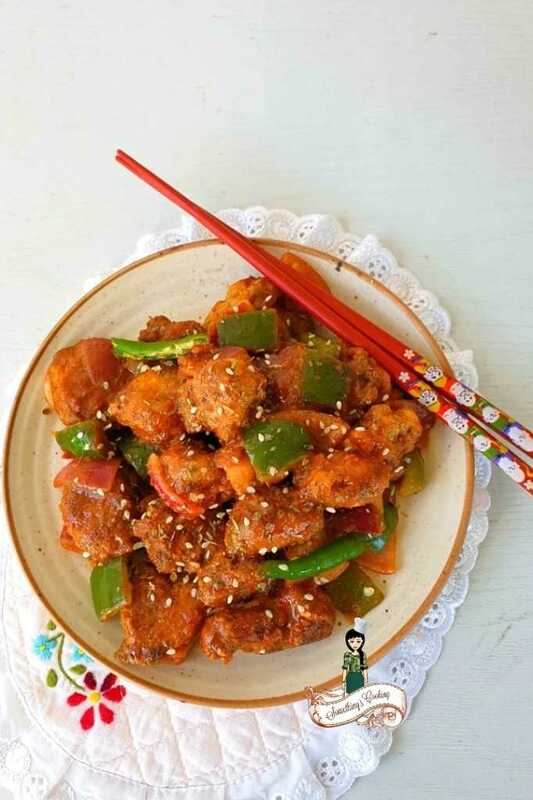 But a regular sweet and sour chicken calls for the addition of sugar. Here, we can substitute sugar with stevia or erythritol. 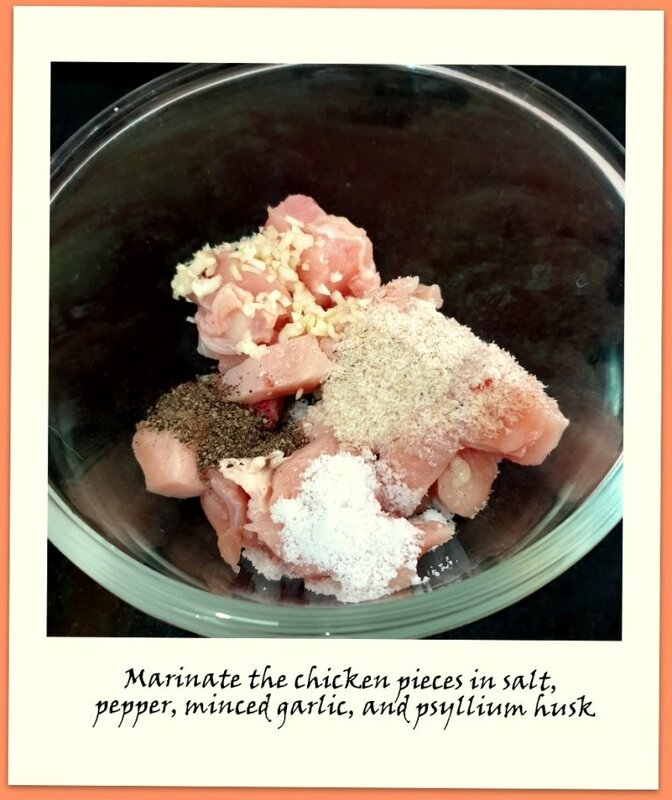 Evenly coat the diced chicken in salt, pepper, minced garlic, and psyllium husk. Leave it for about 20 minutes. Dip the chicken pieces in beaten eggs and double coat in psyllium husk. Combine soy sauce, apple cider vinegar, garlic powder, tomato puree, and stevia. Heat in a saucepan. 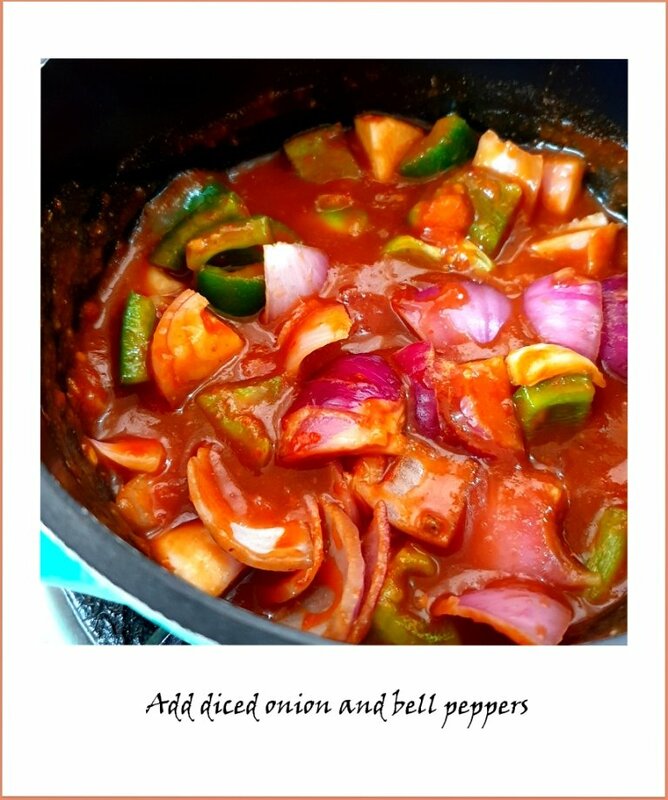 Once it reaches a boil, lower the heat and add diced onion and bell peppers. Cook until tender. Add fried chicken and mix to coat well. Serve warm. 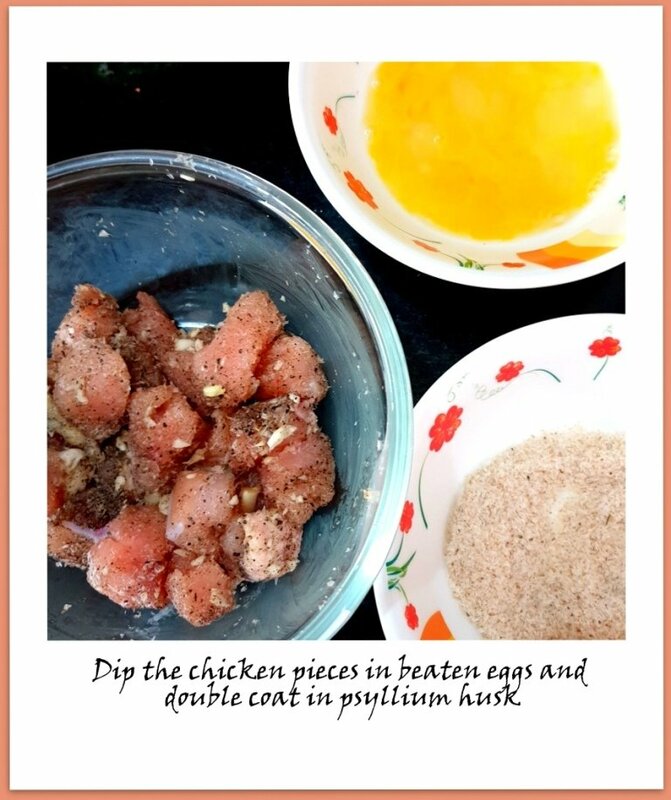 Dip the chicken pieces in beaten eggs and double coat in psyllium husk. 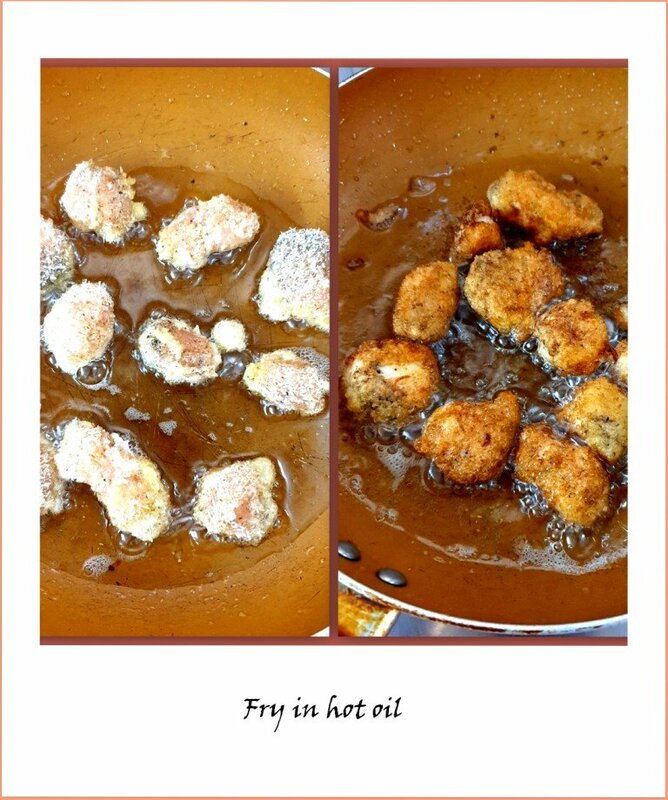 Fry in oil and remove. 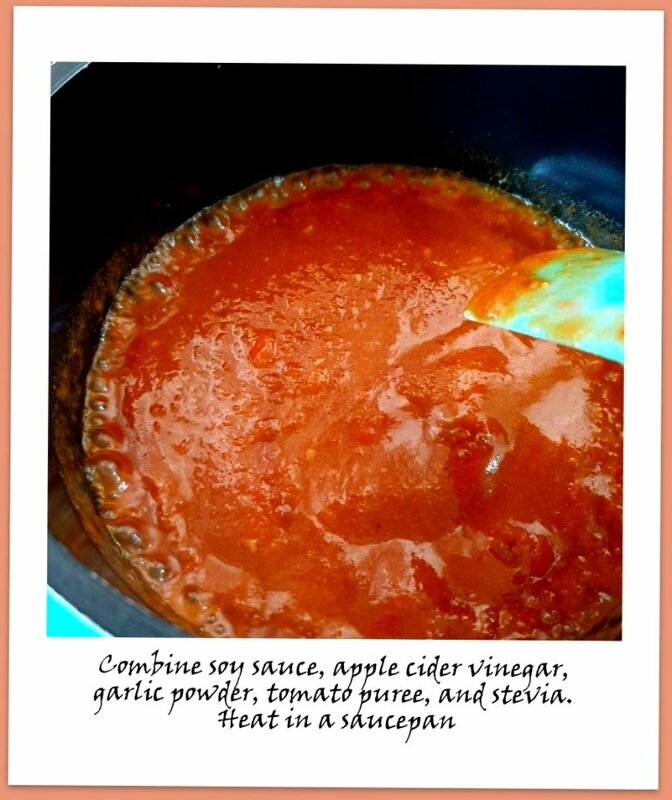 Combine soy sauce, apple cider vinegar, garlic powder, tomato puree, and stevia and heat in a saucepan. Add fried chicken and mix to coat well. 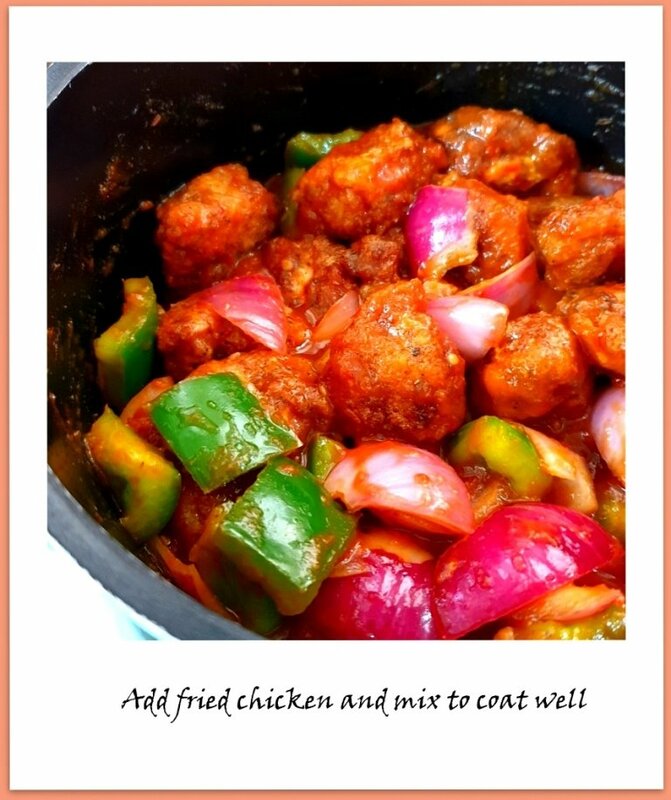 Notes: For regular sweet and sour chicken, use corn flour to coat the chicken instead of psyllium husk. Add 1/2 cup sugar and ketchup instead of stevia and tomato puree. To thicken the sauce add, cornflour slurry. P.S: I am not a dietician. The information shared is after a lot of research and is my personal opinion. Please consult your doctor before taking up any diet. Loved this Keto Diet Snack recipe? You may want to pin this for later. That’s all for now, folks! Would you like to read more Keto Diet Recipes? 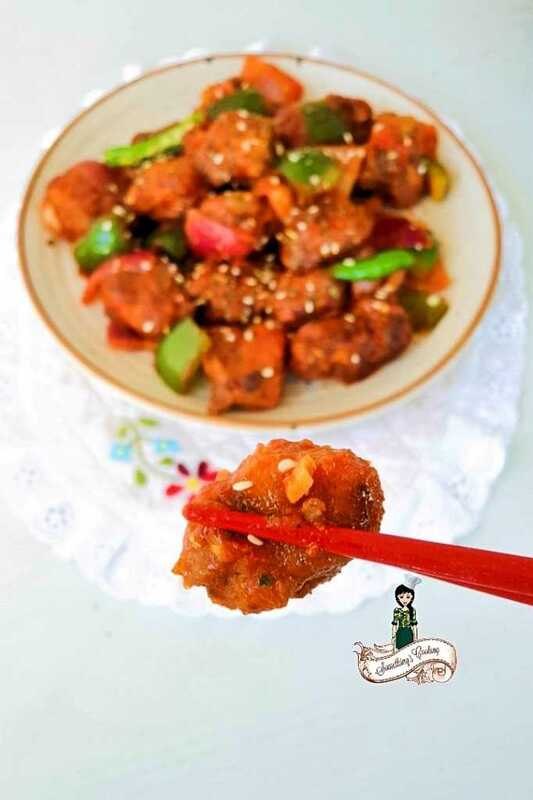 Find more such easy Chinese recipes here. 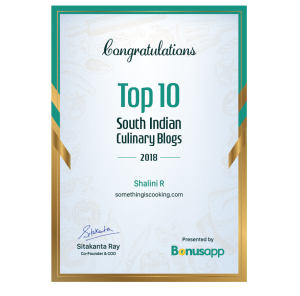 Don’t miss out on any new recipes or updates. Share and connect with me on social media. Instagram | Twitter | Facebook | Pinterest Love love. I have heard (and read) a lot about the Keto diet, and know that it works (through family testimonies). But I personally cannot do the Keto diet in the true sense of the term (just don’t do well with diets – of any sort). That being said, it has inspired me to follow a low carb diet. And that is one thing I am planning on sticking to for a while, till I reach my weight loss and fitness goal. But be that as it may, this recipe sounds super delicious. Bookmarked (and pinned) to try! Over this year, I’ve become more aware about what I’m eating, portion control and eating everything in moderation. Along with working out, this is doing wonders to my body to I’m sticking to this. I’ll make this recipe someday though, it looks so delicious and pretty simple as well. Shalu, no carbs??? Ohhh, so this is what keto diet is all about! I can’t imagine this even! But I guess since the results are so positive, lots of people have taken to it. Pl do a veggie version of this recipe, pretty please? I am not too fond of diets. But this chicken does look quite tasty. Good to see you back in action . Loved your disclaimer and look forward to more such yummy recipes. BTW did you use regular isabgol or did you powder it ? Thank you very much 🙂 I use stevia. I’m not so sure about how to use isabgol.